Download the Git “plug-in” for Matlab, it is just 30 lines of code to enable the git command in Matlab. If you don’t like the command line; Download GitX to track your changes in a GUI. Now you can for example use ici to store your current results in or to refer to in your labbook. 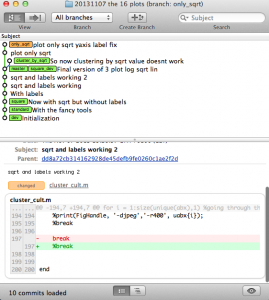 A screenshot showing GitX a GUI for Git: A long, but energetic video of Github developer Scott Chacon showing all the ins and outs of Git. The “Academic version” in PLOS Computational Biology, its about Version Control in general, not Git.